I was recently invited to give a talk at the Xtraordinary Women Holistic Network. In my talk I shared my daily steps that I use to help me make my goals and dreams come true. G – Gratitude – write down all the things you’re grateful for now. The more you’re grateful for, the more the universe will send you to be grateful for. V – Visualisation – paint a picture in your mind of what you want your life, your business, your goals to look like. R – Read – read books, blogposts, listen to audio books or podcasts. Turn off the news and consume content that’s uplifting and supportive. So that’s my daily morning routine. Some days I take my time with each of these and spend more than an hour on it. Other days, I’ll wiz through it, but every day, without fail, I implement most of these. What’s your morning routine? 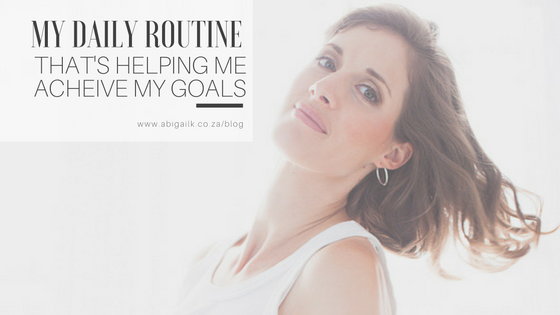 How do ensure that you’re taking daily action to achieve your goals? Thank you so much for sharing your journey with Xtraordinary Women. We all left SO inspired. My pleasure Gwen! I so glad I was able to inspire everyone!